The industry’s top advocacy group in Texas is changing its look, mission statement and communication strategy. The organization plans to emphasize a digital media approach, focusing on an e-newsletter, a Twitter feed, and an interactive Web forum. All these information channels will be based around a new Website, which is being designed from the ground up as a platform for online dialogue. “We want to become visible across the state, to everyone in the industry,” said Doug Dinkins, president of the Aquatic Professionals Education Council. 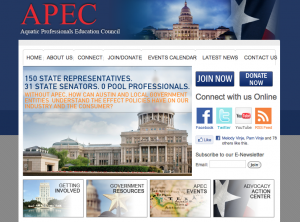 APEC’s board hopes more fluid communication will help individual members respond quickly to local issues. By helping members address one another’s needs as they arise, the organization’s leaders envision APEC becoming a self-sustaining support network. “We’re trying to get more into the grass-roots, instead of dealing with issues just at the state level,” said Scott Waldo, vice president of APEC and president of Platinum Pools, a Pool & Spa News Top Builder in Houston. APEC’s strategy will require coordination between the digital and real-world realms. Thus, some within the organization suggest each step will have to be carefully planned and timed. To overcome hurdles like these, APEC has hired Small Screen Producer, a social media agency specializing in online communications, to create and manage the complex membership network. Along with building a new Website, creating press releases and managing media content, Small Screen will handle APEC’s invoicing and bookkeeping. “They’re a firm with a lot of experience in Web marketing and social media, especially in the pool industry,” Waldo said. Though its revamped communication program will incorporate the direct-mail and word-of-mouth outreach for which APEC has become known, it will focus primarily on digital communication. As part of the new arrangement, Kevin Tucker, who has served as APEC’s information officer for the past several years, is voluntarily stepping down to focus on his outside businesses. His former role, APEC officials explained, represents only a small part of the responsibilities now handled by Small Screen Producer. These changes were inspired in part by APEC’s recent growth, but also because of a growing sense among members that thousands of independent pool professionals across Texas remain detached from the industry. Officials say it’s especially important to spread awareness of legislation affecting pool-related work.